Human Resources professionals are in a fight for their time. More than any other department, HR teams must spend an inordinate amount of time on administrative tasks around their HR services and communications. They can’t focus on more strategic initiatives, like engaging with employees, increasing retention, or improving the employee experience. Combine these inefficiencies with antiquated workflows and HR systems and little time is left for more important HR priorities. To transform from tactical to strategic, you must rethink how to perform the important functions that consume too many resources. 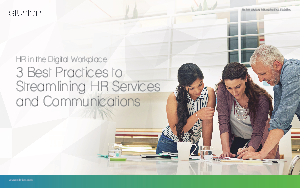 Download this white paper to learn the 3 best practices to streamlining HR services and communications.